Surface is engravable, at an additional charge, up to 3 lines, and will be located in 1 1/4" band at center of urn. Which Font Do You Prefer For Engraving? Where would you like your engraving to appear? 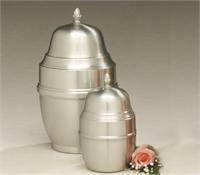 What would you like the engraving on the front of the urn to say? What would you like your engraving on the top of the urn to say? Which stock symbol(s) would you like? Would you like to add letter darkening? Would you like Gold leaf applied to lettering?